Hellions of Troy Roller Derby: Would ya look at that! The local derby-sphere is buzzin' because it was recently announced that the Capital District Trauma Authority is headed down to SUNY Purchase on April 21 to take on the New York Shock Exchange in a double header with Suburbia. Taking a closer look at the poster... well hey! Isn't that Lehman Smothers! Yup yup yes it is! 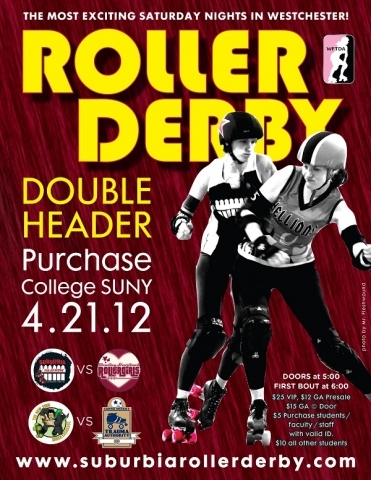 Anyway, you know I'll be headed down to Purchase on 4/21 to catch the derby action. At 6pm, the guys from the New York Shock Exchange battle it out with the Capital District's Trauma Authority. Then at 7:30pm, the ladies of the Suburban Brawl host Bleeding Heartland (#13 in WFTDA's North Central region). Tough guys, fast girls, cupcakes, plenty of parking, and Purchase College's huge, shiny gym.